Product prices and availability are accurate as of 2019-04-19 09:40:53 BST and are subject to change. Any price and availability information displayed on http://www.amazon.co.uk/ at the time of purchase will apply to the purchase of this product. 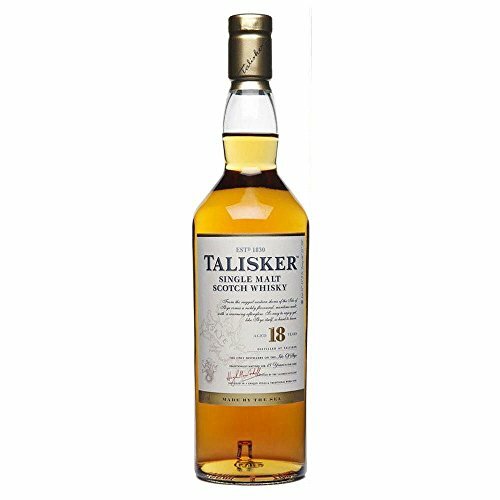 Deep and stormy like the ocean crashing over the rocky shores of its island distillery, Talisker is the only Single Malt Scotch Whisky rugged enough to call the Isle of Skye its home. Awarded Best Whisky in the World at the 27 World Whiskies Awards. Praise indeed! NOSE - Rich and fruity Victoria plums, greengages, perhaps dried orange peel with some butterscotch or rum toffee and a thread of smoke behind. The smoke soon advances into the foreground and the toffee note is joined by a light mintiness. With water, those maritime characteristics emerge once again dry boat varnish, edible seaweed. Still sweet; now with notes of iodine and the smokiness of an un-struck match. BODY - Full. Pleasant, smooth. PALATE - Sweet in front, then more assertive, with a whiff of smoke. The overall effect is warming. The development is towards smoke, coal-tar and toffee. FINISH - Medium length. The characteristic chilli 'catch' in the finish is subtly present in the aftertaste.